Our aesthetic is based on the mythologies of the late 20th century, concerns we can now view with nostalgia. How quaint was our dread of the nuclear apocalypse! How innocent our belief in multimedia! How laughable our anxieties in the face of the Human Genome Project! How curious our fears of the Millennium Bug! Stolen Mirror will explore the psycho-geography of the 20th century, excavating this rich landscape for new fascinations and novel romances. I have been meaning to do this for years, but finally I have jumped into action. There are simply too many interesting works out there, books that are too strange, poetry too outside the formal limits, music that slips between the cracks. Then one day I woke up and realised that I am an editor, designer and photographer; plus I have an understanding of business and printing not constrained by tradition. I have helped other publishers get started and had a hand in a few significant books over the years. So why not channel all this expertise into something I can do with no compromises? My first book and first CD are my own, but I do not plan on this being a vanity press. Yes, I want to release my own works; but the main factor was that these were the easiest titles to ready within my time constraints. In case you are interested, the book was edited, illustrated, designed and printed in a mere three weeks. The upcoming CD was put together in one week. This sort of rapid development is rather unheard-of in the publishing business. 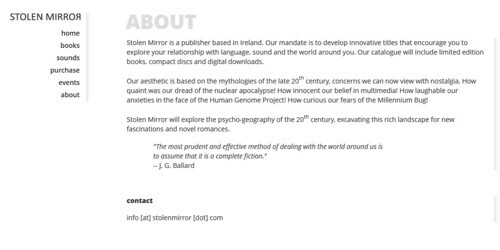 Please check out the Stolen Mirror website for more info. Further bulletins will be coming here on the blog thick and fast.